Bursting with fun, personality and adventure, these stories are a must-read for any lover of classic children’s books. Little Sara Crewe has an imagination so powerful that she can transform the cold attic of Miss Minchin’s boarding school for girls into the bright, tropical paradise of her old life in India – back when her wealthy father was still alive and she was treated like a princess. This magical story of a brave and resilient little girl with a heart of gold is sure to enchant. Rather than be 'sivilized' by the Widow Douglas, Huckleberry Finn - the grubby but good-natured son of a local drunk - sets off with Jim, an escaped slave, to find freedom on the Mississippi river. With the law on their tail, they navigate a world of robbers, slave hunters and con men, and Huck must choose between what society says is 'right' and his own burgeoning understanding of Jim's friendship and humanity. Nostalgic and melancholy in equal measure, The Adventures of Huckleberry Finn by Mark Twain is a razor-sharp satire of the antebellum South. One of the most irrepressible and exuberant characters in the history of literature, Tom Sawyer explodes onto the page in a whirl of bad behaviour and incredible adventures. Whether he is heaving clods of earth at his brother, faking a gangrenous toe, or trying to convince the world that he is dead, Tom's infectious energy and good humor shine through. 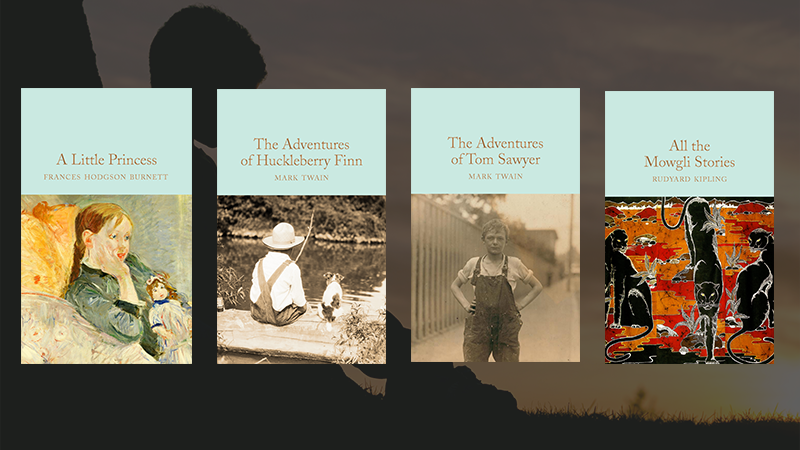 The Adventures of Tom Sawyer is Mark Twain's joyful and nostalgic recollection of tall tales from his own boyhood by the Mississippi. The cheeky, courageous Mowgli - Rudyard Kipling’s famous man-cub, and the star of The Jungle Book – takes centre stage in this beautifully illustrated collection of short stories. Whether he’s hanging out with the cunning panther Bagheera, or learning the Law of the Jungle from Baloo the Bear, every adventure with Mowgli is guaranteed fun.